It's been a while since i saw hubby use a necktie but i always featured him wearing long sleeves with necktie when he is still studying law then. Tiecoon.com has been creating excellent quality necktie since 2004. Their neckwear warehouse is committed to selling neckties wholesale to the public and you can buy ties at the everyday low sale price of $5. Isn't that incredible? It's really affordable but the quality is indeed beautiful and worth buying. You can use them on any occasion. Hubby like the idea of this tie. I wonder when we will attend another gathering? I am really positive that he will be using this. 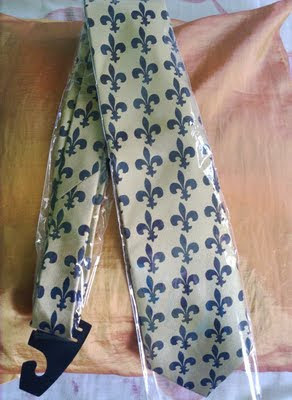 Tiecoon is very generous to give My Journey To Life's reader a chance to have their own Tiecoon neckties. One winner will win a $25 prize of different neckties to choose from. So, that is 5 necktie all in all. Considering that I have just receive the product, i thought of extending the contest till May 2, 2011 to give chance for all of you to enter. This must be done for any additional entries to count. Follow My Journey To Life publicly via Google Friend Connect AND visit Tiecoon.com and leave the link to your favorite tie in your comment. Also leave a valid e-mail address so we can contact you. Contest is WORLDWIDE and winner will be chosen by Random.org. hi there! who won in this giveaway? hi sis, have you picked out the winner?